Hello gypsy jazz lovers, you know that sometimes when you play in a noisy environment with an acoustic guitar, it can be difficult for the audience to hear you, or even worse it is sometimes difficult to hear yourself while playing, which makes it so hard to keep playing with an open heart. Did you know that Django when he discovered the Stimer would play 99% of his shows with it? Imagine how awesome it must have been in his time to witness such a technology allowing you to make an acoustic guitar hearable in a crowded place. It must have been mind blowing. When I was living in Paris, France, I would often witness guitar players using a Stimer or a archtop in a noisy environment, you know why. When I first thought of using an electric guitar to play a gypsy jazz gig, I was afraid that the music would lose authenticity but I am happy to be way over this consideration now. After trying myself all the major guitar brands out there, I am really glad to tell you about the electric guitar that has completely satisfied my expectations when it comes to play the music of Django. 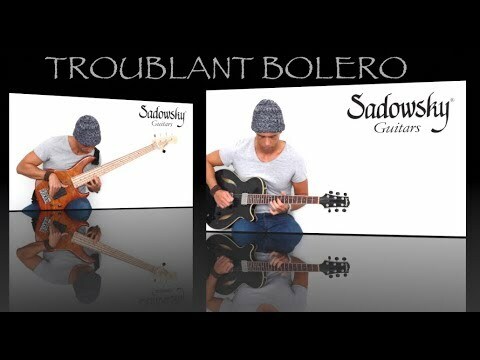 The Sadowsky semi-holow body and the hollow body are my favorites. Enough talk about this, I invite you to take a listen and as soon as you get a chance, to try one of these guitars. They're really incredible and very versatile instruments. Let me know your thoughts about this, or if you have any questions. I hope you'll enjoy this version of Troublant Bolero, which purposely mixes traditional and modern elements. Enjoy! The tone is ok, but I can get the same from my Epiphone 335. Having said that, either one is ok for playing Gypsy Jazz on an electric, and probably many other guitars would work too. The only problem is there are still purists who have a fixed idea of the only way to play Django style, and that is using a Wegen with correct rest stroke picking on a Selmer or Busato and anything else is at best a compromise, at worst, sacrilege. So yes, you carry on doing what you are doing, and I will too, but some will bury their heads in the sand! I thought it's a pretty good electric Django sound. But to add, there are lots of guitars that can get that sound as good as Sadowki, although that's a pretty sweet jazz archtop. I remember Alfonso Ponticelli sometimes played... what was it, an old Kay or something similar, sounded incredible. True, you can get a great tone with any decent guitars. This Sadowsky semi- hollow body has this advantage of being extremely versatile, and very easy to play. I really recommend that you try one at the first occasion. Keep up the good music guys!